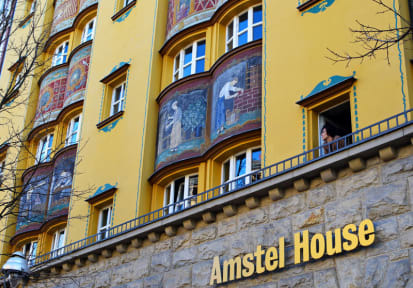 Amstel House Hostel, Berlin, Niemcy : Rezerwuj teraz! Central located, 24h/7 Reception and bar, full infrastructure and the best prices in town! 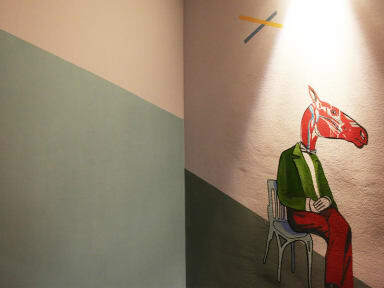 The Amstel House Hostel has everything needed for a great stay in Berlin. By bus or by metro, we are only a few minutes from the central station, historical center, the Brandenburg Gate, the Zoo and the biggest and most famous shopping street Kurfuersten Damm. Our amazing building was officially opened in 1914 - in the presence of the last Emperor of Germany, William II - and first used as a house for young single men. Its impressive facade in Art Nouveau style remains exactly the same and it is now a historical heritage. The inside building however has been completely renovated and modernized in order to fulfill all our guests needs. Our great infrastructure offers 24h/7 reception and bar, game room, free internet, bike rent, laundry and tickets services. We provide a diverse range of clean and comfortable accommodation such as dorms, 4bedrooms, family rooms, twin rooms - ensuite or with shared facilities - and single rooms. Our team is at your service 24h/7, whether at the reception to check you in and help you with tourist information, or at the bar serving you the many beer types of our menu. We offer cheap breakfast buffet and all-you-can-eat burger BBQ (Nov. to Apr. ), a guest kitchen, free Wi-Fi all around the hostel, laundry and tickets service, bike rent, game room, free maps, karaoke and DJs nights, safe, luggage room and much more to ensure your comfort and the supply of all your needs. For very good price you have everything needed in a hostel: kitchen, big common area, free WIFI, bar and so one. Nice and helpful staff 24 hours. I enjoyed staying there :) There is just one thing that could be changed - please offer to your guests warmer quilts especially in autumn and winter time and bigger pillow. For this price i guess the stay was OK, the room was over the bar so it was loud in the evening.